Ice cream, along with chocolate, pizza, tacos, and margaritas are one of my most favorite guilty pleasures. As a child I loved anything oreo, or bubble gum and then there was cookie dough. Those are all good choices, well...maybe not the bubble gum. Have you tried that as an adult? Yikes. Now, I love to go for more interesting flavors. Green Tea, Ginger, and this French Lavender. Which is pretty amazing on it's own, but then you add thin chocolate cookies, a dark chocolate shell and a good pinch of flaky salt. It is basically a combination made for each other. I recently had the great opportunity to work with the kind people from Snoqualmie Ice Cream. And if you haven't heard of them, go out now and buy a pint or 3. Because it simply is the best ice cream, ever. Rich, creamy and their flavors are creative without being too crazy. 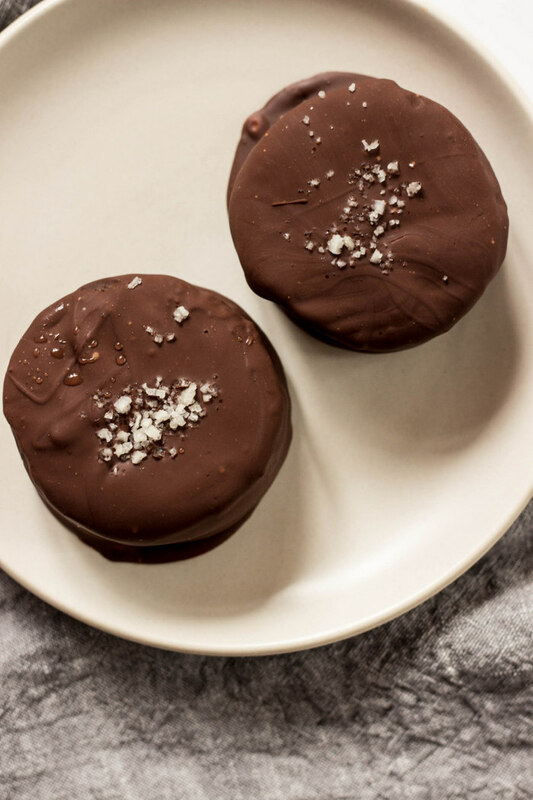 These salted dark chocolate lavender ice cream sandwiches are simply perfect. Sweet, salty, crunchy and rich. Make a big batch and keep them in your freezer, because we all have one of those nights where you are desperately seeking for that certain something. These are it. In a large heat proof bowl, add the butter and chocolate chips. Place over double boiler and stir until melted. Once thoroughly melted, remove from the heat. Whisk in the sugar and vanilla. Add the egg and combine together. In a medium bowl, add flour, cocoa, salt and baking soda. Whisk together and add to the large bowl. Using a hand mixer, or transferring the mixture to your kitchen aid, beat everything together. Lay out a sheet of parchment paper and place the dough in the center, form a disk, wrapping the dough in parchment paper and place in the refrigerator for 2 hours. Let the dough sit on the counter for about 5 minutes. Lightly flour a work surface. Cut the dough in half, and begin rolling out the dough to a 1/4" thickness. Using a 2" round cookie cutter, or the size of your choice, begin cutting out the dough. Placing the circles onto the baking sheet. Re-shape the dough, rolling it back out until all dough has been cut into circles. Bake for 10-12 minutes until firm. Set aside and let cool, completely. When the cookies are 100% cooled, flip them over. Grab the ice cream pints. Cut off the carton and slice the ice cream into 1/2" slices. Using the same cookie cutter as before, cut out the ice cream and place onto cookie. This step can be skipped, as you can simply scoop out the ice cream. Place a cookie onto the ice cream, creating a sandwich. Once all cookies have been topped with ice cream. Place the sandwiches into the freezer for about 15 minutes. In the mean time, heat the dark chocolate over a double boiler until melted. Once melted remove from the heat and stir in the coconut oil. Set aside and let cool. You do not want the chocolate to be hot otherwise it will melt the ice cream sandwiches. Line another baking sheet with parchment paper. When ready, dip each ice cream sandwich into the cooled melted chocolate. Flip over and coat the other side. Remove and place onto baking sheet. Top with a pinch of flaky salt and continue with each ice cream sandwich. Once again, place the ice cream sandwiches back into the freezer for another 15 minutes. Then, they are ready! This post was sponsored by Snoqualmie Ice Cream. All thoughts are my own.